Danish Army Specific: The Humber FWD was acquired shortly after WW II. At least the ambulance version was bought. Historical: Throughout WW II Humber Ltd produced a range of military pattern vehicles based on a common 8 cwt 4 x 4 Super Snipe chassis. 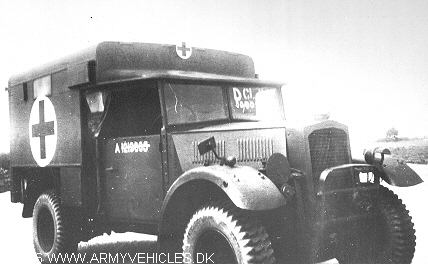 Included were a heavy utility car, a light field ambulance, a truck and some armoured types (Humber Mk III & IIIA). Both the GS and FFW versions followed the style of the earlier 4x2 vehicles, but the cab and bonnet were much simplified for ease of production. The truck had a standardised WD body with three seats and a superstructure with folding legs that could be used of the vehicle as a tent. The FFW version had two seats in the back and a no. 11 radio. The ambulance had a 2 stretcher body made by Thrupp & Maberly. Well over 1100 ambulanced were produced in two batches. Shortly after the end of the war the type was declared obsolete in the British Army and auctioned off. The British Broadcasting Corporation employed some converted ambulances as recording vans for war correspondents in combat areas accompanied by a utility vehicle to serve as a tender. Engine: Own 6-cylinder, 4.086 cm3 (249 cubic inches) displacement, carburettor, liquid-cooled. Fuel capacity: 73 liter (16 gallons).